On top of this, you’ve masted Chinese tones. You know all 4 tones like the back of your hand and even know that there’s a secret 5th neutral tone! When Chinese words are written in pinyin with the tones above the word, you can read the whole word correctly. Practice with our pinyin lessons here. If you’ve learned all the things (and only once you’ve learned all these things!) are you ready to learn Chinese words. Please do not skip ahead. Make sure you can say the words properly. Now, onto learning Chinese vocabulary. Vocabulary is a big part of language learning. The key is to learn the most important words ist. Learn the high-frequency words that appear as often as possible. Did you know that you can read/understand 90% of daily Chinese with just 1000 Chinese characters! How cool is that? So which words to learn first? Luckily, the Chinese proficiency test tells us. The HSK (Hanyu Shuiping Kaoshi) has 6 levels and tells you what vocabulary you should learn for each of the 6 levels. THe HSK1 has 150 vocabulary words to learn. The list below is 250 words that include these 150 plus some from HSK 2. If you’re looking for full lists of the top 100, 250, 500, or even 100 words to learn, we have those here for free and with downloadable PDF. If you want lists of HSK 1 Vocabulary, HSk2 Vocabulary, HSK 3 Vocabulary, or HSK 4 Vocabulary we have all of those two. 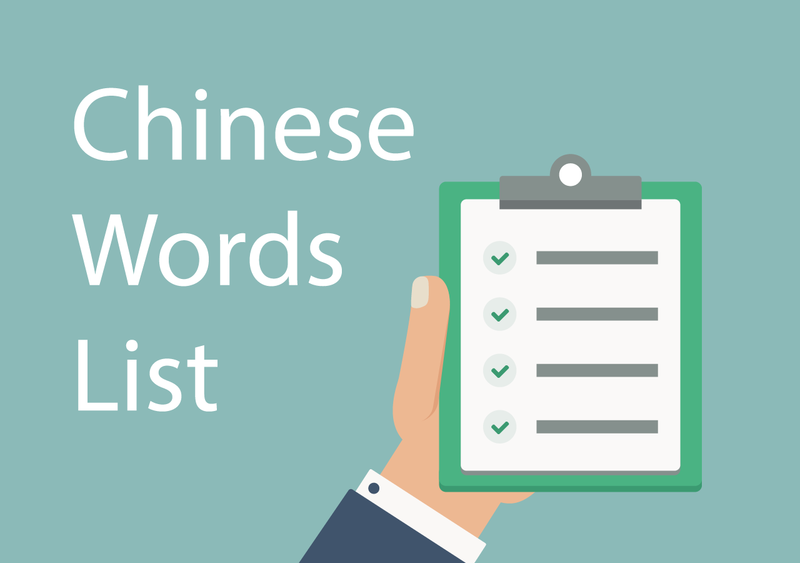 Good luck with this Chinese word list. This should get you started. All these words are used in our free PDF lessons. When you’re ready, sign up for a free trial class apply what you’ve learned with a live Chinese tutor! 叫 jiào Verb to be called 我叫大卫。 Wǒ jiào Dàwèi. My name is David. 姓 xìng Noun/Verb surname, one’s family name is 我姓程。 Wǒ xìng chéng. My surname is Cheng. 名字 míngzi Noun name 她的名字是玛丽。 Tā de míngzi shì Mǎlì. Her name is Mary. 哪国人 nǎguórén Phrase a person of which country 你是哪国人？ Nǐ shì nǎ guó rén? Which country are you from ? 你 nǐ Pronoun you 你姓程 吗？ Nǐ xìng chéng ma? Is your surname Cheng? 我 wǒ Pronoun I, me 我不姓程。 Wǒ bú xìng Chéng. My surname is not Cheng. 认识你很高兴 rènshì nǐ hěn gāoxìng Phrase It’s nice to meet you 我叫大卫, 认识你很高兴。 Wǒ jiào dàwèi, rènshì nǐ hěn gāoxìng. My name is David. It is nice to meet you. 是 shì Verb is 我不是美国人, 我是日本人。 Wǒ bú shì Měiguó rén,wǒ shì Rìběn rén I’m not American, I’m Japanese. 美国 Měiguó Noun United States 他是美国人吗？ Tā shì Měiguó rén ma? Is he an American? 中国 Zhōngguó Noun China 我不是中国人。 Wǒ bú shì Zhōngguó rén. I’m not Chinese. 忙 máng Adj busy 你忙吗？ Nǐ máng ma? Are you busy? 累 lèi Adj tired , tiring 我很累。 Wǒ hěn lèi. I am tired. 好 hǎo Adj good 你好吗？ Nǐ hǎo ma? How are you? 你们 nǐmen Pronoun you (plural), y’all 你们都是学生吗？ Nǐmen dōu shì xuéshēng ma? Are you all students? 学生 xuéshēng Noun student, students 我不是学生。 Wǒ bú shì xuéshēng. I am not a student. 老师 lǎoshī Noun teacher 我的老师不是中国人。 Wǒ de lǎoshī bú shì Zhōngguó rén. My teacher is not Chinese. 再见 zàijiàn Phrase goodbye 再见！ Zàijiàn. Goodbye. 日本 Rìběn Noun Japan 他不是日本人。 Tā bú shì Rìběn rén. He is not a Japanese. 他 tā Pronoun He, him 他累不累? Tā lèi búlèi? Is he tired or not? 要 yào Verb to want 我要喝咖啡。 Wǒ yào hē kāfēi. I want to drink coffee. 喝 hē Verb to drink 我很喜欢喝中国茶。 Wǒ hěn xǐhuan hē Zhōngguó chá. I really like to drink Chinese tea. 吃 chī Verb to eat 你喜欢吃什么？ Nǐ xǐhuan chī shénme? What do you like to eat? 咖啡 kāfēi Noun coffee 你喜不喜欢喝咖啡？ Nǐ xǐ bùxǐhuan hē kāfēi? Do you like to drink coffee? 菜 cài Noun dish, cuisine 你喜欢哪国菜？ Nǐ xǐhuan nǎ guó cài? Which country’s food do you like? 茶 chá Noun tea 我很喜欢喝茶。 Wǒ hěn xǐhuan hē chá. I really like to drink tea. 口 kǒu Measure word measure word for family members 我家有三口人 Wǒ jiā yǒu sān kǒu rén. There are three people in my family. 个 gè Measure word general measure word, measure word for people 我有两个妹妹。 Wǒ yǒu lǐang gè mèimei. I have two younger sisters. 爸爸 bàba Noun father 我的爸爸有一个姐姐。 Wǒ de bàba yǒu yí gè jiějie. My father has an older sister. 妈妈 māma Noun mother 他的妈妈是玛丽。 Tā de māma shì Mǎlì. His mother is Mary. 哥哥 gēge Noun older brother 我有两个哥哥。 Wǒ yǒu liǎng gè gēge. I have two older brothers. 姐姐 jiějie Noun older sister 他的姐姐叫玛丽。 Tā de jiějie jiào Mǎlì. His older sister is called Mary. 弟弟 dìdi Noun younger brother 你有没有弟弟？ Nǐ yǒu méiyǒu dìdi? Do you have younger brothers? 妹妹 mèimei Noun younger sister 你的妹妹叫什么名字? Nǐ de mèimei jiào shénme míngzì? What is your younger sister’s name? 家 jiā Noun home, family 我家有三口人。 Wǒ jiā yǒu sān kǒu rén. There are three people in my family. 和 hé Conj and 我有一个哥哥和一个姐姐。 Wǒ yǒu yí gè gēge hé yí gè jiějie. I have an older brother and an older sister. 谁 shéi Pronoun who 他是谁? Tā shì shéi? Who is he? 狗 gǒu Noun dog 平安的狗叫奶茶。 Píng’ān de gǒu jiào nǎichá. Ping An’s dog is called Milk Tea. 好看 hǎokàn Adj good-looking 我的房子很好看 Wǒ de fángzi hěn hǎokàn. My house is good-looking. 书 shū Noun book, books 我有一本书。 Wǒ yǒu yìběn shū. I have a book. 兄弟姐妹 xiōngdì jiěmèi Noun siblings 美美有三个兄弟姐妹。 Měiměi yǒu sān gè xiōngdì jiěmèi. Meimei has there siblings. 房子 fángzi Noun house 他喜欢他爸爸妈妈的房子。 Tā xǐhuan tā bàba māma de fángzi. He likes his parent’s house. 家人 jiārén Noun family member 我和我的家人都喜欢喝咖啡。 Wǒ hé wǒ de jiārén dōu xǐhuan hē kāfēi. My family and I all like to drink coffee. 介绍 jièshào Verb to introduce 请你介绍你的家人。 Qǐng nǐ jièshào nǐ de jiārén. Please introduce your family. 漂亮 piàoliàng Adj beautiful 你姐姐很漂亮。 Nǐ jiějie hěn piàoliàng. Your older sister is really beautiful. 张 zhāng Measure word a measure word for photograph, picture, paper, table etc. 我有很多张照片。 Wǒ yǒu hěn duō zhāng zhàopiàn. I have many pictures. 女儿 nǚér Noun daughter 我有一个漂亮的女儿。 Wǒ yǒu yí gè piàoliàng de nǚér. I have a beautiful daughter. 猫 māo Noun cat 他有很多只猫。 Tā yǒu hěnduō zhī māo. He has many cats. 照片 zhàopiàn Noun pictures, photos 我有很多照片。 Wǒ yǒu hěn duō zhàopiàn. I have many pictures. 多 duō Adj many, more 我有很多书。 Wǒ yǒu hěn duō shū. I have many books. 两 liǎng Numeral two 我有两个女儿。 Wǒ yǒu liǎng gè nǚér. I have two daughters. 可爱 kěài Adj cute,lovely 他很可爱。 Tā hěn kěài. She is cute. 块 kuài Measure word piece； dollar 我有两块钱。 Wǒ yǒu liǎng kuài qián. I have two dollars. 杯 bēi Measure word cup, cups 我有一杯咖啡。 Wǒ yǒu yì bēi kāfēi. I have a cup of coffee. 瓶 píng Measure word bottle, bottles 我有一瓶牛奶。 Wǒ yǒu yì píng niúnǎi. I have a bottle of milk. 买 mǎi Verb buy 我们去买东西。 Wǒmen qù mǎi dōngxi. Let’s go to buy some things. 钱 qián Noun money 那个东西多少钱? Nà gè dōngxi duōshǎo qián? How much does that thing cost? 东西 dōngxi Noun thing, things, stuff 这不是我的东西。 Zhè búshì wǒ de dōngxi. This is not my stuff. 谢谢 xièxie Phrase Thank you 谢谢你! Xièxie nǐ! Thank you! 不客气 búkèqì Phrase You’re welcome A: 谢谢你帮忙检查我的文章。 B: 不客气，随时都乐意！ A: Xièxiè nǐ bāngmáng jiǎnchá wǒ de wénzhāng. B: Bù kèqì, suíshí dōu lèyì! A: Thanks for checking my essay. B: No problem! Happy to anytime! 些 xiē Measure word some 这些东西是谁的? Zhè xiē dōngxi shì shéi de? Whose things are these? 百 bǎi Noun hundred 这个东西一百块钱。 Zhègè dōngxi yìbǎi kuài qián. This thing is one hundred dollars. 一共 yígòng Adv altogether 三杯咖啡和一杯茶,一共多少钱？ Sān bēi kāfēi hé yì bēi chá, yígòng duōshǎo qián？ How much for 3 cups of coffee and one cup of tea? 今天 jīntiān Noun today 我今天晚上看电影。 Wǒ jīntiān wǎnshàng kàn diànyǐng. I’ll watch a movie tonight. 几点 jǐdiǎn Phrase What time 现在几点? Xiànzài jǐdiǎn？ What time is it? 分 fēn Noun minute 现在是两点十分。 Xiànzài shì liǎng diǎn shí fēn. It is ten past two o’clock now. 看 kàn Verb to read, to watch 他喜欢看电影。 Tā xǐhuan kàn diànyǐng. He likes to watch movies. 电影 diànyǐng Noun movie 你喜欢看什么电影？ Nǐ xǐhuan kàn shénme diànyǐng? What movie do you like to watch? 上网 shàngwǎng Verb Object Surf Internet 我喜欢上网。 Wǒ xǐhuan shàngwǎng. I like to surf the Internet. 现在 xiànzài Noun now 现在是一点五十五分。 Xiànzài shì yì diǎn wǔshí wǔ fēn. It’s one fifty-five now. 半 bàn Noun half 现在是六点半。 Xiànzài shì liù diǎn bàn. Now it is six thirty. 做 zuò Verb to do 你喜欢做什么? Nǐ xǐhuān zuò shénme? What do you like to do? 做饭 zuòfàn Verb Object to cook 你喜欢做饭吗？ Nǐ xǐhuan zuò fàn ma? Do you like to cook? 吃饭 chīfàn Verb Object to eat 你今天几点吃饭？ Nǐ jīntiān jǐdiǎn chīfàn? What time do you eat today? 请问 qǐngwèn Phrase Excuse me, may I ask… 请问这个东西多少钱? Qǐngwèn zhège dōngxi duōshǎo qián? May I ask about how much does this thing cost? 饭馆 fànguǎn Noun restaurant 这间饭馆好不好？ Zhè jiān fànguǎn hǎo bùhǎo? Is this restaurant good or not? 服务员 fúwùyuán Noun waiter, waitress 这家饭馆的服务员，人很好。 Zhè jiā fànguǎn de fúwùyuán, rén hěnhǎo. The waiter/ waitress from this restaurant is very nice. 杯子 bēizi Noun cup 我们要两个杯子。 Wǒmen yào liǎng gè bēizi. We would like to have two cups. 真 zhēn Adv really 你妹妹真漂亮。 Nǐ mèimei zhēn piàoliang. Your younger sister is really pretty. 点菜 diǎncài Verb Object to order food 请服务员来帮我们点菜。 Qǐng fúwùyuán lái bāng wǒmen diǎn cài. Please ask the waiter to take our order. 好吃 hǎochī Adj tasty/delicious 我妈妈做的饭很好吃。 Wǒ māma zuò de fàn hěn hǎochī. The dish made from my mother is tasty. 水 shuǐ Noun water 我有一杯水。 Wǒ yǒu yì bēi shuǐ. I have a cup of water. 少 shǎo Adj few 我们家书很少。 Wǒmen jiā shū hěn shǎo. We have very few books at home. 买单 mǎidān Verb Object to pay 服务员，请买单。 Fúwùyuán, qǐng mǎidān. Waiter, we want to pay. 昨天 zuótiān Noun yesterday 昨天我跟我妈妈去看电影。 Zuótiān wǒ gēn wǒ māma qù kàn diànyǐng. I went to watch a movie with my mother yesterday. 明天 míngtiān Noun tomorrow 明天要不要去吃饭? Míngtiān yàobúyào qù chīfàn? Do you want to go and eat tomorrow? 什么时候 shénme shíhou Phrase when 你什么时候去看电影? Nǐ shénme shíhou qù kàn diànyǐng? When are you going to watch movie? 上午 shàngwǔ Noun morning 我上午要上课。 Wǒ shàngwǔ yào shàngkè I have classes in the morning. 星期 xīngqī Noun Week, day of the week 星期一我们要上课。 Xīngqī yī wǒmen yào shàngkè. We have class on Monday. 起床 qǐchuáng Verb Object wake up 我八点起床。 Wǒ bādiǎn qǐchuáng. I wake up at eight. 早饭 zǎofàn Noun breakfast 我们九点吃早饭。 Wǒmen jiǔdiǎn chī zǎofàn. We eat breakfast at nine. 睡觉 shuìjiào Verb Object sleep 我爸爸十点睡觉。 Wǒ bàba shídiǎn shuìjiào. My dad sleeps at ten. 上课 shàngkè Verb Object go to class,attend class 我们明天要上课。 Wǒmen míngtiān yào shàngkè. We have class tomorrow. 想 xiǎng Verb to want to ,to plan to/to think 我想跟你看电影。 Wǒ xiǎng gēn nǐ kàn diànyǐng. I want to watch a movie with you. 月 yuè Measure word month 明天是十二月六日。 Míngtiān shì shíèr yuè liù rì. Tomorrow is December 6th. 日 rì Measure word day 今天是十二月五日。 Jīntiān shì shíèr yuè wǔ rì. Today is December 5th. 下午 xiàwǔ Noun afternoon 你明天下午做什么? Nǐ míngtiān xiàwǔ zuò shénme? What are you going to do tomorrow afternoon? 晚上 wǎnshàng Noun evening 你明天晚上看电影吗? Nǐ míngtiān wǎnshàng kàn diànyǐng ma? Do you want to watch a movie tomorrow night? 请 qǐng Verb to treat, to invite 明天我请你去中国饭馆吃饭。 Míngtiān wǒ qǐng nǐ qù Zhōngguó fànguǎn chīfàn. Tomorrow I’ll treat you to a meal at a Chinese restaurant. 来 lái Verb to come 他来我家吃饭。 Tā lái wǒ jiā chīfàn. He came to my house and had a meal. 有空 yǒukòng Verb have free time, to be free 你有空吗? Nǐ yǒukòng ma? Are you free? 对不起 duìbùqǐ Phrase sorry A: 对不起。 B: 没关系 。 A: Duìbùqǐ. B: Méiguānxi. A: I am sorry. B: It’s ok.
没关系 méiguānxi Phrase that’s ok, no problem A: 对不起。 B: 没关系。 A: Duìbùqǐ. B: Méiguānxi. A: I am sorry. B: It’s ok.
生日 shēngrì Noun birthday 我的生日是二月十八号。 Wǒ de shēngrì shì èr yuè shíbā hào. My birthday is February eighteenth. 打球 dǎqiú Verb Object to play ball games, ball sports 每个周末我都会跟朋友去打球 Měi gè zhōumò wǒ dūhuì gēn péngyou qù dǎqiú I play basketball with my friends every weekend. 篮球 lánqiú Noun basketball 你打篮球吗? Nǐ dǎ lánqiú ma? Do you play basketball? 球赛 qiúsài Noun match, ball games 你喜欢看球赛吗? Nǐ xǐhuan kàn qiúsài ma? Do you like to watch sports matches? 逛街 guàngjiē Verb Object shopping 他喜欢去逛街。 Tā xǐhuan qù guàngjiē. She likes to go shopping. 周末 zhōumò Noun weekend 周末他做什么? Zhōumò tā zuò shénme? What does he do on weekends? 早起 zǎoqǐ Verb to wake up early 我喜欢早起去打球。 Wǒ xǐhuan zǎoqǐ qù dǎ qiú. I like to wake up early to play the ball. 觉得 juéde Verb to feel,to think,to consider 我觉得做饭很好玩儿。 Wǒ juéde zuòfàn hěn hǎowánr. I think cooking is fun. 好玩儿 hǎowán’er Adj interesting, fun, enjoyable 打篮球很好玩儿。 Dǎ lánqiú hěn hǎowánr. It’s fun to play basketball. 运动 yùndòng Noun exercise, to exercise 你喜欢什么运动? Nǐ xǐhuan shénme yùndòng? What sports do you like? 电影院 diànyǐngyuàn Noun cinema 我现在在电影院看电影。 Wǒ xiànzài zài diànyǐngyuàn kàn diànyǐng. I am now at the cinema watching a movie. 学习 xuéxí Verb to study 他在中国学习中文。 Tā zài Zhōngguó xuéxí Zhōngwén. He studies Chinese in China. 酒吧 jiǔba Noun bar 晚上我们去酒吧喝啤酒。 Wǎnshàng wǒmen qù jiǔbā hē píjiǔ. We are going to a bar to drink beer at night. 啤酒 píjiǔ Noun beer 我们一起喝啤酒。 Wǒmen yìqǐ hē píjiǔ。 We drink beer together. 有意思 yǒuyìsi Adj interesting, fun 我觉得出门很有意思! 我喜欢出门去运动。 Wǒ juéde chūmén hěn yǒuyìsi! Wǒ xǐhuan chūmén qù yùndòng. I think going out is fun! I like to go out to exercise. 无聊 wúliáo Adj boring,bored 他觉得出门太麻烦了，也觉得很无聊。 Tā juéde chūmén tài máfán le, yě juéde hěn wúliáo. He thinks going out is too troublesome and boring. 麻烦 máfán Verb be annoyed,to bother, troublesome, annoying 我是一个麻烦的人。 Wǒ shì yí gè máfán de rén. I am a troublesome person. 出门 chūmén Verb Object to go outside 他早上九点出门去上课。 Tā zǎoshàng jiǔdiǎn chūmén qù shàngkè. He goes to class at 9 in the morning. 种 zhǒng Measure word kind,type 你喜欢吃哪种菜? Nǐ xǐhuan chī nǎ zhǒng cài? What kind of food do you like? 一起 yìqǐ Adv together 星期二我们一起去吃日本菜。 Xīngqīèr wǒmen yìqǐ qù chī Rìběn cài. Let’s have Japanese food on Tuesday together. 算了 suànle Phrase forget about it A: 外面下雨，我不能跟你出去。 B: 算了，我跟玛丽去。 A: Wàimiàn xiàyǔ, wǒ bùnéng gēn nǐ chūqù. B: Suànle, wǒ gēn Mǎlì qù. A: It’s raining outside, I can’t go out with you. B: Fine, I’ll go out with Mary. 下雨 xiàyǔ Verb Object raining 今天, 明天都下雨。 Jīntiān, míngtiān dōu xiàyǔ. Today and tomorrow it will rain. 外面 wàimiàn Noun outside 他现在在外面,不在家。 Tā xiànzài zài wàimiàn , bú zài jiā. He is out now, he’s not at home. 没问题 méi wèntí Phrase no problem A: 你有空吗？我们一起去打球，好不好？ B: 没问题。 A: Nǐ yǒu kòng ma? Wǒmen yīqǐ qù dǎqiú, hǎo bùhǎo? B: Méi wèntí. A: Do you have free time? Let’s go play ball games, what do you think? B: No problem. 可是 kěshì Conj but 我想出去, 可是外面下雨。 Wǒ xiǎng chūqù,kěshì wàimiàn xiàyǔ. I want to go out, but it’s raining outside. 做菜 zuòcài Verb cooking 妹妹喜欢做菜。 Mèimei xǐhuan zuò cài。 My younger sister likes to cook. 唱歌 chànggē Verb to sing 我们一起去唱歌，好吗？ Wǒmen yīqǐ qù chànggē, hǎo ma? How about we go sing together? 说 shuō Verb say,speak a language 请您再说一次。 Qǐng nín zài shuō yīcì. Can you please say it one more time? 汉语 hànyǔ Noun Mandarin 我明天有汉语课。 Wǒ míngtiān yǒu hànyǔ kè. I have Chinese class tomorrow. 英语 yīngyǔ Noun English 我不会说英语。 Wǒ bú huì shuō yīngyǔ. I can’t speak English. 不错 búcuò Adj pretty good, not bad 她唱得不错。 Tā chàng dé búcuò. She sings well. 教 jiāo Verb to teach 你可以教我怎么说英语吗? Nǐ kěyǐ jiāo wǒ zěnme shuō yīngyǔ ma? Can you teach me how to say English? 写字 xiězì Verb Object to write 汉语老师教我们怎么写字。 Hànyǔ lǎoshī jiào wǒmen zěnme xiě zì. The Chinese teacher teach us how to write words. 快 kuài Adj fast, quick 他走得很快。 Tā zǒu de hěn kuài. He walks fast. 功课 gōngkè Noun homework 我今天有很多功课。 Wǒ jīntiān yǒu hěn duō gōngkè. I have a lot of homework today. 图书馆 túshūguǎn Noun library 他星期一去图书馆看书。 Tā xīngqī yī qù túshūguǎn kànshū. He goes to library on Mondays to read books. 中饭 zhōngfàn Noun lunch 我们一起吃中饭吧! Wǒmen yìqǐ chī zhōngfàn ba! Let’s eat lunch together. 晚饭 wǎnfàn Noun dinner 我没有时间做晚饭。 Wǒ méiyǒu shíjiān zuò wǎnfàn. I don’t have time for making dinner. 中午 zhōngwǔ Noun noon 我中午上英语课。 Wǒ zhōngwǔ shàng yīngyǔ kè. I have English class at noon. 非常 fēicháng Adv very,extremely 他非常喜欢看书, 也喜欢运动。 Tā fēicháng xǐhuan kànshū, yě xǐhuan yùndòng. He really likes to read books, he also likes to do sports. 题 tí Noun question 这题好难，我不会。 Zhè tí hǎo nán, wǒ bú huì. This question is so hard, I don’t know how to do it. 难 nán Adj difficult 写汉字很难，说汉语也很难! Xiě hànzì hěn nán, shuō hànyǔ yě hěn nán. Writing Chinese is difficult, speaking Chinese is also difficult. 新 xīn Adj new 这是一支新手机. Zhè shì yìzhī xīn shǒujī. This is a new cell phone. 大 dà Adj big 这支手机有一点大, 我不喜欢。 Zhè zhī shǒujī yǒu yìdiǎn dà, wǒ bù xǐhuan. This phone is a bit big, I don’t like it. 商店 shāngdiàn Noun shop, store 这家商店卖一些手机。 Zhè jiā shāngdiàn mài yì xiē shǒujī. This store sells some cell phones. 手机 shǒujī Noun cell phone 这不是我的手机。 Zhè bú shì wǒ de shǒujī. This is not my cell phone. 看一看 kànyíkàn Phrase look, have a look 我去商店看一看。 Wǒ qù shāngdiàn kànyíkàn. Let me go to the store and have a look. 能 néng Verb to express ability 哪支手机能上网？ Nǎ zhī shǒujī néng shàngwǎng? Which mobile phone can access the Internet? 上面 shàngmiàn Noun on top of 你的猫在我的房子上面! Nǐ de māo zài wǒ de fángzi shàngmiàn. Your cat is on top of my house. 下面 xiàmiàn Noun down/under 照片在杯子下面。 Zhàopiàn zài bēizi xiàmiàn. The photo is under the cup. 旁边 pángbiān Noun next to/beside 饭馆旁边是图书馆。 Fànguǎn pángbiān shì túshūguǎn. The library is next to the restaurant. 里面 lǐmiàn Noun inside 图书馆里面有很多书。 Túshūguǎn lǐmiàn yǒu hěn duō shū. There are a lot of books inside the library. 大楼 dàlóu Noun building 我家旁边有很多大楼。 Wǒ jiā pángbiān yǒu hěn duō dàlóu. There are a lot of buildings next to my house. 海边 hǎibiān Noun beach 我们一起去海边玩儿吧! Wǒmen yìqǐ qù hǎibiān wánr ba! Let’s go to the beach together and have fun! 住 zhù Verb to live 我住在那个大楼里面。 Wǒ zhù zài nàge dàlóu lǐmiàn. I live inside that building. 知道 zhīdào Verb to know 我知道他家在哪儿! Wǒ zhīdào tā jiā zài nǎr. I know where his house is. 欢迎 huānyíng Noun/Verb to welcome, welcome 欢迎你来我家玩儿。 Huānyíng nǐ lái wǒ jiā wánr. You are welcome to come to my house to hang out. 玩儿 wánr Verb to play, have fun 我喜欢去海边玩儿。 Wǒ xǐhuan qù hǎibiān wánr. I like to go to the beach and have fun. 公共汽车 gōnggòng qìchē Noun bus 我每个星期都坐公共汽车去上汉语课。 Wǒ měige xīngqī dōu zuò gōnggòng qìchē qù shàng Hànyǔ kè. I take the bus every week to Chinese class. 自行车 zìxíngchē Noun bicycle/bike 我喜欢骑自行车。 Wǒ xǐhuan qí zìxíngchē. I like to ride a bicycle. 走路 zǒulù Verb Object to walk 我的朋友每天都走路去学校。 Wǒ de péngyǒu měitiān dōu zǒulù qù xuéxiào. My friend walks to school every day. 站 zhàn Measure word stations, stops 从我家到图书馆坐公共汽车要三站。 Cóng wǒ jiā dào túshūguǎn zuò gōnggòng qìchē yào sān zhàn. It takes 3 stations to get from my house to the library. 椅子 yǐzi Noun chair 你家有几把椅子? Nǐ jiā yǒu jǐ bǎ yǐzi? How many chairs do you have at home? 休息 xiūxí Verb to take a rest 你中午几点休息? Nǐ zhōngwǔ jǐdiǎn xiūxi? What time do you rest at noon? 上班 shàngbān Verb Object to go to work 你在哪儿上班? Nǐ zài nǎr shàngbān? Where do you work? 坐 zuò Verb to take (a bus, airplane etc) 我坐公共汽车去电影院。 Wǒ zuò gōnggòng qìchē qù diànyǐngyuàn. I go to cinema by bus. 骑 qí Verb to ride 我常骑自行车去上课。 Wǒ cháng qí zìxíngchē qù shàngkè. I often go to class by bike. 超市 chāoshì Noun supermarket 我想去超市买鸡蛋。 Wǒ xiǎng qù chāoshì mǎi jīdàn. I want to buy eggs in the supermarket. 件 jiàn Measure word Measure word (for events, things, clothes etc) 这件衣服是我妹妹的。 Zhè jiàn yīfú shì wǒ mèimei de. This cloth is my younger sister’s. 衣服 yīfú Noun clothes 他昨天买了很多漂亮的衣服。 Tā zuótiān mǎi le hěn duō piàoliàng de yīfú. He bought a lot of nice cloth yesterday. 对了 duìle Phrase by the way 对了，他昨天告诉我他不来学校。 Duìle, tā zuótiān gàosù wǒ tā bù lái xuéxiào. By the way, he told me yesterday that he is not coming to school. 告诉 gàosù Verb to tell 她没有告诉我这件事情。 Tā méiyǒu gàosù wǒ zhè jiàn shìqíng. She didn’t tell me this thing. 鸡蛋 jīdàn Noun egg 我的早餐是鸡蛋和牛奶。 Wǒ de zǎocān shì jīdàn hé niúnǎi. My breakfast was eggs and milk. 忘了 wàngle Verb to forget 我昨天忘了去超市。 Wǒ zuótiān wàngle qù chāoshì. I forgot to go supermarket yesterday. 牛奶 niúnǎi Noun milk 我每天早上都喝一杯咖啡和一瓶牛奶。 Wǒ měitiān zǎoshàng dōu he yì bēi kāfēi hé yì píng niúnǎi. I drink a cup of coffee and a bottle of milk every morning. 怎么 zěnme Adv how to…? 这个字非常难,我不知道怎么写。 Zhè gè zì fēicháng nán. Wǒ bù zhīdào zěnme xiě. This word is so difficult. I don’t know how to write it. 走 zǒu Verb to get there,walk 从这儿往前走就到他家了。 Cóng zhèr wǎng qián zǒu jiù dào tā jiā le. Go forward from here, you’ll go right to his house. 前 qián Noun front/forward/ahead 往前走就是我家。 Wǎng qián zǒu jiù shì wǒ jiā. Go forward and that’s my house. 就 jiù Adv then,right away 图书馆，往前走右拐就到了。 Túshūguǎn, wǎng qián zǒu yòuguǎi jiù dào le. Go forward and turn right, the library is there. 邮局 yóujú Noun post office 图书馆在邮局的旁边。 Túshūguǎn zài yóujú de pángbiān. The post office is next to the library. 认识 rènshì Verb to know, to recognise 我不认识那个人。 Wǒ bú rènshì nàge rén. I don’t know that person. 路 lù Noun road 我知道这条路的名字! Wǒ zhīdào zhè tiáo lù de míngzì. I know the name of this road. 左拐 zuǒguǎi Verb to turn left 那条路左拐就到我家。 Nà tiáo lù zuǒguǎi jiù dào wǒ jiā. Turn left on that road and you’ll arrive at my house. 右拐 yòuguǎi Verb to turn right 邮局在前面那条路右拐。 Yóujú zài qiánmiàn nà tiáo lù yòuguǎi. Post office is at the road ahead, turn right. 从 cóng Prep from 从这儿往左走就是邮局。 Cóng zhèr wǎng zuǒ zǒu jiùshì yóujú. Turn left from here and there is the post office. 到 dào Verb to arrive, arrive 从这里往前走, 就到了。 Cóng zhèlǐ wǎng qián zǒu, jiù dào le. Go straight from here, then you will arrive. 事情 shìqíng Noun Affair,matter,thing 这件事情很难也很麻烦。 Zhè jiàn shìqing hěn nán yě hěn máfán. This thing is very difficult and troublesome. 得 děi Adv must,have to 我得出门去上课! Wǒ děi chū mén qù shàng kè. I have to go out to go to class. 时间 shíjiān Noun time 我有很多时间写功课。 Wǒ yǒu hěn duō shíjiān xiě gōngkè. I have a lot of time to write homework. 怕 pà Verb to fear, to be afraid of 学生都很怕老师。 Xuéshēng dōu hěn pà lǎoshī The students are all afraid of teacher. to worry 我很担心今年的汉语考试考得不好。 Wǒ hěn dānxīn jīnnián de Hànyǔ kǎoshì kǎo de bù hǎo I am really worried that I did bad on this year’s Chinese test. 考试 kǎoshì Noun to test, test, exam 你明天考试考什么？ Nǐ míngtiān kǎoshì kǎo shénme? What are your exams tomorrow? 今年 jīnnián Noun this year 今年我要跟家人去中国玩儿。 Jīnnián wǒ yào gēn jiārén qù Zhōngguó wánr. I am going to China with my family this year. 不好意思 bùhǎoyìsi Phrase excuse me, to be sorry 不好意思，请问这儿可以照相吗? Bùhǎo yìsi, qǐngwèn zhèr kěyǐ zhàoxiàng ma? Excuse me, can we take pictures here? 听音乐 tīng yīnyuè Verb Object to listen to music 我喜欢听音乐。 Wǒ xǐhuan tīng yīnyuè. I like to listen to music. 附近 fùjìn Adv nearby 你家附近有商店吗? Nǐ jiā fùjìn yǒu shāngdiàn ma? Is there a shop nearby your house? 照相 zhàoxiàng Verb Object to take a photo 他周末喜欢去爬山、照相。 Tā zhōumò xǐhuan qù páshān, zhàoxiàng. He likes to go mountain climbing and take pictures on the weekend. 博物馆 bówùguǎn Noun museum 博物馆里面不可以照相! Bówùguǎn lǐmiàn bù kěyǐ zhàoxiàng. You can’t take pictures inside the museum. 朋友 péngyǒu Noun friend, friends 我跟我朋友明天要一起去博物馆。 Wǒ gēn wǒ péngyou míngtiān yào yìqǐ qù bówùguǎn. I am going to the museum with my friend tomorrow. 天 tiān Measure word day 一个星期有七天。 Yí ge xīngqī yǒu qī tiān. There are seven days in a week. 等一会儿 děng yìhuǐr Phrase Wait a moment, later 我跟我朋友等一会儿要一起去逛街。 Wǒ gēn wǒ péngyou děng yìhuǐr yào yìqǐ qù guàngjiē. My friend and I will go shopping later. 地方 dìfāng Noun area, place 那个地方在哪儿? Nà gè dìfāng zai nǎr? Where is that place? 远 yuǎn Adj far 图书馆离邮局很远。 Túshūguǎn lí yóujú hěn yuǎn. The library is far away from the post office. 近 jìn Adj near/close 图书馆离我家很近! Túshūguǎn lí wǒ jiā hěn jìn. The library is close to my house. 小时 xiǎoshí Noun hour 从我家到图书馆要三个小时。 Cóng wǒ jiā dào túshūguǎn yào sān gè xiǎoshí. It takes three hours from my house to library. 山 shān Noun mountain 我家旁边有一座山。 Wǒ jiā pángbiān yǒu yí zuò shān. There’s a mountain next to my house. 爬山 páshān Verb Object to climb a mountain, to hike a mountain 我们这个周末要去爬山。 Wǒmen zhège zhōumò yào qù páshān. We are going mountain climbing this weekend. 公司 gōngsī Noun company 我爸爸的公司离我们家很远。 Wǒ bàba de gōngsī lí wǒmen jiā hěn yuǎn. My father’s company is far away from our house. 分钟 fēnzhōng Noun minute 从这儿去那儿要走三十分钟。 Cóng zhèr qù nàr yào zǒu sānshí fēnzhōng. To get from here to there you need to walk thirty minutes. 要 yào Verb to need, require 从我家到公司要走半小时。 Cóng wǒ jiā dào gōngsī yào zǒu bàn xiǎoshí. It takes half an hour from my house to the company by foot. 方便 fāngbiàn Adj convenient 我家旁边有一些餐厅，也有超市和图书馆 ， 住在那里很方便。 Wǒ jiā pángbiān yǒu yìxiē cāntīng, yě yǒu chāoshì hé túshūguǎn. Zhù zài nàlǐ hěn fāngbiàn. There are some restaurants, supermarkets and libraries near my house. Living there is very convenient. 车票 chēpiào Noun transportation ticket 坐公共汽车要买车票。 Zuò gōnggòng qìchē yào mǎi chēpiào. You need to buy a ticket to take the bus. 出租车 chūzūchē Noun taxi 中国有很多出租车。 Zhōngguó yǒu hěn duō chūzūchē. There are a lot of taxis in China. 地铁 dìtiě Noun subway, metro 我每天都坐地铁去上班。 Wǒ měitiān dōu zuò dìtiě qù shàngbān. I go to work by subway every day. 载 zài Verb to give somebody a ride 我姐姐载我去超市买东西。 Wǒ jiějie zài wǒ qù chāoshì mǎi dōngxi. My older sister drives me to buy things in the supermarket. 汽车 qìchē Noun car 我有三辆汽车。 Wǒ yǒu sān liàng qìchē. I have three cars. 开 kāi Verb to drive ( a machine, car, airplan), to open 我爸爸每天都开车去上班。 Wǒ bàba měitiān dōu kāi chē qù shàngbān. My father drives to work every day. 风景 fēngjǐng Noun scenery 这儿的风景很漂亮。 Zhèr de fēngjǐng hěn piàoliang. The scenery here is pretty. 便宜 piányí Adj cheap 汽车在中国很便宜。 Qìchē zài Zhōngguó hěn piányi. Cars are cheap in China. 等 děng Verb to wait 请你等我一起去上课。 Qǐng nǐ děng wǒ yìqǐ qù shàngkè. Please wait for me to go to class together. 迟到 chídào Verb to be late 他上班迟到了。 Tā shàngbān chídào le. She is late for work. 从不 cóng bù Adv never 我从不爬山。 Wǒ cóngbù páshān. I never go mountain climbing. 约 yuē Verb to make an appointment/to invite. 他朋友约我一起去爬山。 Tā péngyou yuē wǒ yìqǐ qù páshān . His friend asked me to go mountain climbing together. 上次 shàngcì Noun last time 上次我们看电影的时候，他也迟到了。 Shàngcì wǒmen kàn diànyǐng de shíhou, tā yě chídào le. Last time he was also late for watching a movie,. 已经 yǐjīng Adv already 今天早上我去等公交车，我到公车站的时候, 公车已经走了。 Jīntiān zǎoshàng wǒ qù děng gōngjiāochē, wǒ dào gōngchē zhàn de shíhou, gōngchē yǐjīng zǒu le. This morning I was going to wait for a bus, but when I arrived at the bus stop, the bus had already left. 多久 duōjiǔ Phrase how long..? 请问从超市到邮局要多久? Qǐngwèn cóng chāoshì dào yóujú yào duōjiǔ? How long does it take to get from the supermarket to the post office? 说话 shuōhuà Verb Object to speak/ to talk 他喜欢跟美国人说话，练习英语。 Tā xǐhuan gēn Měiguó rén shuōhuà, liànxí yīngyǔ. He likes to speak with Americans to practice his English. 为什么 wèishénme Phrase why 现在已经晚上十二点了，你为什么不睡觉? Xiànzài yǐjīng wǎnshàng shíèrdiǎn le, nǐ wèi shénme bú shuìjiào? It’s already twelve a.m. now, why are you not sleeping? 有用 yǒuyòng Adj useful 这个东西很有用也很方便。 Zhège dōngxi hěn yǒuyòng yě hěn fāngbiàn. This thing is useful and convenient. 放假 fàngjià Verb Object to have a vacation 我明天放假。 Wǒ míngtiān fàngjià. I’ll be on holiday tomorrow. 因为 yīnwèi Conj Because 因为我喜欢吃中国菜，所以我常去中国饭馆。 Yīnwèi wǒ xǐhuan chī Zhōngguó cài, suǒyǐ wǒ cháng qù Zhōngguó fànguǎn. I like to eat Chinese food, so I go to Chinese restaurant frequently. 所以 suǒyǐ Conj therefore 因为我喜欢爬山，所以周末我都去。 Yīnwèi wǒ xǐhuan páshān, suǒyǐ zhōumò wǒ dōu qù. I like to climb the mountain, so I go there on weekends. 刚 gāng Adv just 我刚放假，你想去哪儿玩儿? Wǒ gāng fàngjià, nǐ xiǎng qù nǎr wánr? I just have holiday, where do you want to go? 看见 kànjiàn Verb to see, to catch sight of 你昨天看见什么了? Nǐ zuótiān kànjiàn shénme le? What did you see yesterday? 以前 yǐqián Noun Noun/ before 我三年以前不会说汉语，现在说得很好。 Wǒ sān nián yǐqián búhuì shuō Hànyǔ, xiànzài shuō de hěnhǎo. I couldn’t speak Chinese three years ago, but now I can speak well. 书法 shūfǎ Noun calligraphy 我喜欢写书法。 Wǒ xǐhuan xiě shūfǎ. I like to write calligraphy. 开始 kāishǐ Verb to start 从明天开始，我不上汉语课了。 Cóng míngtiān kāishǐ, wǒ bú shàng Hànyǔ kè le. From tomorrow I don’t take Chinese class anymore. 学校 xuéxiào Noun school 这是我的学校，很漂亮吧? Zhè shì wǒ de xuéxiào, hěn piàoliang ba? This is my school. It’s really pretty, isn’t it? 课 kè Noun lesson, class 你今天上什么课? Nǐ jīntiān shàng shénme kè? What class do you have today? 可能 kěnéng Adv maybe, might, probably 我可能不能去他家玩儿。 Wǒ kěnéng bù néng qù tā jiā wánr. I might not go to his house to hang out. 最近 zuìjìn Noun recently 他最近工作很忙，不常给我打电话。 Tā zuìjìn gōngzuò hěn máng, bù cháng gěi wǒ dǎdiànhuà. He has been busy recently, only rarely does he call me. 喂 wéi Phrase Hello (when answer the telephone) 喂，你好，请问有什么事? Wéi, nǐhǎo, qǐngwèn yǒu shénme shì? Hello, how can I help you? 开会 kāihuì Verb Object to hold a meeting 我下午一点要开会。 Wǒ xiàwǔ yì diǎn yào kāihuì. I have meeting at one p.m.
打电话 dǎdiànhuà Verb Object to make a phone call 你晚上可以打电话来我家。 Nǐ wǎnshàng kěyǐ dǎdiànhuà lái wǒ jiā. You can call me at night. 那 nà Adv then, in that case A: 今天外面下雨，不能打篮球。 B: 那我们去看电影吧。 A: Jīntiān wàimiàn xiàyǔ, bùnéng dǎ lánqiú. B: Nà wǒmen qù kàn diànyǐng ba. A: It’s raining outside, we can’t play basketball. B: Then let’s see a movie. 桌子 zhuōzi Noun table 我家有三张桌子。 Wǒ jiā yǒu sān zhāng zhuōzi. I have three tables at home. 生日会 shēngrì huì Noun birthday party 他的生日会是一月二十五日。 Tā de shēngrì huì shì yī yuè èrshíwǔ rì. His birthday party is on the twenty-fifth of January. 苹果派 píngguǒ pài Noun apple pie 我不喜欢吃苹果派。 Wǒ bù xǐhuan chī píngguǒ pài. I don’t like to eat apple pie. 邀请 yāoqǐng Verb to invite 我想邀请你跟你的家人来我的生日会。 Wǒ xiǎng yāoqǐng nǐ gēn nǐ de jiārén lái wǒ de shēngrì huì. I would like to invite you and your family to my birthday party. 好久不见 hǎojiǔ bújiàn Phrase long time, no see 好久不见，你好吗? Hǎojiǔ bújiàn, nǐhǎo ma? Long time no see, how are you? 给 gěi Verb to give 因为我要考试，所以他给我很多书。 Yīnwèi wǒ yào kǎoshì, suǒyǐ tā gěi wǒ hěnduō shū. He gives me a lot of books because I have a test. 礼物 lǐwù Noun gift 我不知道他喜欢什么礼物。 Wǒ bù zhīdào tā xǐhuan shénme lǐwù. I don’t know what present he likes. 蓝色 lánsè Noun blue 我有一件蓝色的衣服。 Wǒ yǒu yí jiàn lánsè de yīfú. I have a blue t-shirt. 饺子 jiǎozi Noun dumplings 饺子是中国菜的一种。 Jiǎozi shì Zhōngguó cài de yì zhǒng. Dumpling is a kind of Chinese food. 旅游 lǚyóu Verb travel 我喜欢和我的朋友一起去旅游。 Wǒ xǐhuan hé wǒ de péngyou yìqǐ qù lǚyóu. I like to go travelling with my friends. 经验 jīngyàn Noun experience 他的工作经验不多。 Tā de gōngzuò jīngyàn bùduō. He doesn’t have much working experience. 次 cì Measure word Measure word for enumerated events, time 这件事情我说了三次了。 Zhè jiàn shìqing wǒ shuō le sān cì le. I have told you about this three times. 快乐 kuàile Adj happy 旅游是一件很快乐的事情。 Lǚyóu shì yí jiàn hěn kuàilè de shìqing. Traveling is a very happy thing. 最 zuì Adv the most, “-est” 我最喜欢的人是我爸爸妈妈。 Wǒ zuì xǐhuan de rén shì wǒ bàba māma. I like my parents the most. 有名 yǒumíng Adj famous 这是这儿最有名的饭馆。 Zhè shì zhèr zuì yǒumíng de fànguǎn. This is the most famous restaurant here. 飞机 fēijī Noun airplane 从美国到中国要坐十几个小时的飞机。 Cóng Měiguó dào Zhōngguó yào zuò shí jǐ ge xiǎoshí de fēijī. It takes more than ten hours from America to China by plane. 听说 tīngshuō Verb to hear (sb. said) 听说你去过中国很多次？ Tīngshuō nǐ qùguò Zhōngguó hěnduō cì? I heard that you have been to China many times? 高兴 gāoxìng Adj glad, happy 很高兴你也喜欢日本菜。 Hěn gāoxìng nǐ yě xǐhuan Rìběn cài. I’m glad you liked Japanese food. 旅馆 lǚguǎn Noun hostel, hotel 你去旅游的时候喜欢住哪种旅馆？ Nǐ qù lǚyóu de shíhou xǐhuan zhù nǎ zhǒng lǚguǎn？ When you travel, which kind of hotel do you like to stay at? 纪念品 jìniànpǐn Noun souvenir 你会买纪念品给你家人吗？ Nǐ huì mǎi jìniànpǐn gěi nǐ jiārén ma? Will you buy souvenirs for your family? 计划 jìhuà Verb to plan, to plan to do sth. 你计划去哪几个国家旅游？ Nǐ jìhuà qù nǎ jǐ ge guójiā lǚyóu? What countries are you planning to go to? 习惯 xíguàn Verb to get used to 你习惯吃哪国菜？ Nǐ xíguàn chī nǎguó cài? Which country’s food do you get used to eat? 去年 qùnián Noun last year 你去年去过哪些国家？ Nǐ qùnián qùguò nǎxiē guójiā? What countries did you visit last year? 回国 huíguó Verb Object to return to home country 他二月三日回国。 Tā èr yuè sān rì huíguó. He will return home on 3rd February. 打算 dǎsuàn Verb to plan 我打算三点去图书馆看书。 Wǒ dǎsuàn sān diǎn qù túshūguǎn kànshū. I plan to go to library to read books at 3pm. 北京 běijīng Noun Peking 我爸爸的公司在北京，他在那儿工作。 Wǒ bàba de gōngsī zài Běijīng, tā zài nàr gōngzuò. My dad’s company is in Peking, he is working there. 外国 wàiguó Noun abroad/foreign country 我跟我的朋友放假要去外国旅游。 Wǒ gēn wǒ de péngyou fàngjià yào qù wàiguó lǚyóu. My friend and I are going abroad during our vacation. 只 zhǐ Adv only 放假的时候，他的家人只喜欢在家休息。 Fàngjià de shíhou tā de jiārén zhǐ xǐhuan zài jiā xiūxi. His family only like to stay at home during holiday. 后天 hòutiān Noun the day after tomorrow 因为他后天要去北京工作，所以明天晚上我们一起去酒吧喝酒聊天吧! Yīnwèi tā hòutiān yào qù Běijīng gōngzuò, suǒyǐ míngtiān wǎnshàng wǒmen yìqǐ qù jiǔbā hējiǔ liáotiān ba. He is going to work in Peking the day after tomorrow, so let’s go to the bar and have a drink tomorrow night. 女朋友 nǚpéngyou Noun girlfreind 我的女朋友是美国人。 Wǒ de nǚpéngyou shì Měiguó rén. My girlfriend is American. 走 zǒu Verb to leave 真舍不得你走，要常回来看我们。 Zhēn shěbude nǐ zǒu, yào cháng huílái kàn women. Really don’t want you to go, come back to visit us often. 舍不得 shěbude Verb to hate to part with 我们舍不得你回国。 Wǒmen shěbude nǐ huí guó. We don’t want you to return to your country. 同学 tóngxué Noun classmate 我汉语课的同学是美国人。 Wǒ Hànyǔ kè de tóngxué shì Měiguó rén. My classmate from Chinese class is an American. 想 xiǎng Verb to miss 他到中国去工作三年了，他的家人都很想他。 Tā dào Zhōngguó qù gōngzuò sān nián le, tā de jiārén dōu hěn xiǎng tā. He was working in China for 3 years, his family miss him a lot. 写信 xiě xìn Verb to write a letter 你回国以后要常写信给我。 Nǐ huí guó yǐhòu yào cháng xiěxìn gěi wǒ. You have to write me a letter more often when you are back home. 搭 dā Verb to take (transportation) 从美国搭飞机到中国要十三个小时。 Cóng Měiguó dā fēijī dào Zhōngguó yào shí sān gè xiǎoshí. It takes thirteen hours from America to China by plane. 回来 huílái Verb to come back 已经很晚了，你妹妹怎么还没回来? Yǐjīng hěn wǎn le, nǐ mèimei zěnme háiméi huílái? It’s late, why is your younger sister not back yet? 天气 tiānqì Noun weather 今天天气不错，我们要不要一起出门去玩儿? Jīntiān tiānqì búcuò, wǒmen yào búyào yìqǐ chūmén qù wánr? Today’s weather is good, how about go out and play? 冷 lěng Adj cold 今天外面很冷，早一点儿回来。 Jīntiān wàimiàn hěn lěng, zǎo yìdiǎnr huílái. It’s really cold outside, come back home early. 热 rè Adj hot 天气很热，我们去游泳吧! Tiānqì hěn rè, wǒmen qù yóuyǒng ba! It’s so hot, let’s go swimming. 滑雪 huáxuě Verb Object to ski 放假的时候，我都跟我的家人去日本滑雪。 Fàngjià de shíhou, wǒ dōu gēn wǒ de jiārén qù Rìběn huáxuě. During vacation time, I often go to Japan to ski with my family. 游泳 yóuyǒng Noun to swim 天气很热的时候，我们都喜欢去游泳。 Tiānqì hěn rè de shíhou, wǒmen dōu xǐhuan qù yóuyǒng. When it’s hot, we all like to go swimming. 下雪 xiàxuě Verb Object to snow 外面下雪了，真漂亮。 Wàimiàn xiàxuě le, zhēn piàoliang. It’s snowing outside, it’s very pretty. 舒服 shūfu Adj comfortable 今天的天气不冷也不热，很舒服。 Jīntiān de tiānqì bù lěng yě bú rè, hěn shūfu. Today is not so cold and not so warm. It’s comfortable. 岁 suì Measure word year old 你是几岁开始学中文的？ Nǐ shì jǐ suì kāishǐ xué Zhōngwén de? How old did you start to learn Chinese? 高 gāo Adj high；tall 你的家人都比你高吗？ Nǐ de jiārén dōu bǐ nǐ gāo ma? Is your family all taller than you? 那么 nàme Conj so then… 为什么你的中文说得那么好？ Wèishénme nǐ de zhōngwén shuō dé nàme hǎo? Why do you speak Chinese so well? 胖 pàng Adj fat 哪个比较胖？ Nǎge bǐjiào pàng? Which one is fatter? 矮 ǎi Adj short 弟弟比较矮。 Dìdì bǐjiào ǎi. My younger brother is shorter. 瘦 shòu Adj thin 瘦的人健康吗？ Shòu de rén jiànkāng ma? Are thin people healthy? 长 cháng Adj long 那条路不长。 Nà tiáo lù bù cháng. That road is not long. 头发 tóufà Noun hair 他的头发很长吗？ Tā de tóufà hěn cháng ma? Is his hair very long? 医生 yīshēng Noun doctor 我今天不舒服，我想我得去看医生。 Wǒ jīntiān bù shūfu, wǒ xiǎng wǒ dĕi qù kàn yīshēng. I don’t feel well, I think I need to see a doctor. 生病 shēngbìng Verb Object to be sick 他生病了。所以今天不来上班。 Tā shēngbìng le, suǒyǐ jīntiān bù lái shàngbān. He is sick, so he will not come to work today. 看病 kànbìng Verb Object to see a doctor 我跟我妹妹今天都不舒服, 所以我们下午的时候就一起去看病了。 Wǒ gēn wǒ mèimei jīntiān dōu bù shūfu, suǒyǐ wǒmen xiàwǔ de shíhou jiù yìqǐ qù kànbìng le. My younger sister and I both don’t feel well, so we go to see a doctor in the afternoon together. 药 yào Noun medicine 这个药每天上午、中午、晚上都要吃一次。 Zhè gè yào měitiān shàngwǔ, zhōngwǔ, wǎnshàng dōu yào chī yícì. This medicine has to be taken once in the morning, noon and night. 身体 shēntǐ Noun body, health 我爸爸的身体不太好，所以他常常生病。 Wǒ bàba de shēntǐ bú tài hǎo, suǒyǐ tā cháng cháng shēngbìng. My dad’s health is in bad condition therefore he is often sick. 水果 shuǐguǒ Noun fruit 你生病要多吃点儿水果。 Nǐ shēngbìng yào duō chī diǎnr shuǐguǒ. When you are sick, you should eat more fruit. 蔬菜 shūcài Noun vegetables 谁都喜欢吃蔬菜水果。 Shéi dōu xǐhuan chī shūcài shuǐguǒ. Everyone likes to eat vegetables and fruit. 医院 yīyuàn Noun hospital 医院离我家不近，坐公交车要一小时。 Yīyuàn lí wǒ jiā bú jìn, zuò gōngjiāochē yào yì xiǎoshí. The hospital is not close to my house, it takes one hour by bus. 请假 qǐngjià Verb Object to take a leave 我们后天要去旅游，所以我要请假。 Wǒmen hòutiān yào qù lǚyóu,suǒyǐ wǒ yào qǐngjià. I’m going to travel for the day after tomorrow, so I need to take the day off. 一 yī Noun one, single 我有一个弟弟。 Wǒ yǒu yíge dìdì. I have a younger brother. 七 qī Numeral seven 这有七个人。 Zhè yǒu qī ge rén. There are seven people. 三 sān Numeral three 我每天喝三杯咖啡。 Wǒ měitiān hē sān bēi kāfēi. I drink three cups of coffee a day. 上 shàng Noun/Verb on, on top of 桌上有一本书。 Zhuō shàng yǒu yì běn shū. There is a book on the table. 下 xià Noun/Verb under, off, leave 窗下有一只猫。 Chuāng xià yǒu yì zhī māo. There is a cat under the window. 不 bù Adv do not 我不吃牛肉。 Wǒ bù chī niúròu. I do not eat beef. 九 jiǔ Numeral nine 我的爸爸有九个姐姐。 Wǒ de bàba yǒu jiǔ ge jiějiě. My dad has nine sisters. 了 le Adv past tense 这件衣服太贵了。 Zhè jiàn yīfu tài guìle. This piece of clothing is too expensive. 二 èr Numeral two 昨天星期二。 Zuótiān xīngqī ‘èr. Yesterday was Tuesday. 五 wǔ Numeral five 我家有五口人。 Wǒjiā yǒu wǔ kǒu rén. My family has five people. 人 rén Noun people, person 你是挪威人吗？ Nǐ shì Nuówēi rén ma? Are you Norwegian? 什么 shénme Adj/Adv what 这是什么？ Zhè shì shénme? What is this? 会 huì Verb to be able to, can do 我会说一点儿汉语。 Wǒ huì shuō yìdiǎnr hànyǔ. I can speak a little Chinese. 儿子 érzi Noun son 我的儿子叫王阳。 Wǒ de érzi jiào wáng yáng。 My son is called Wang Yang. 八 bā Numeral eight 我有八本中文书。 Wǒ yǒu bā běn zhōngwén shū. I have eight Chinese books. 六 liù Numeral six 中国人喜欢数字六。 Zhōngguó rén xǐhuan shùzì liù. Chinese people like the number six. 写 xiě Verb to write 我会写我的中文名字。 Wǒ huì xiě wǒ de zhōngwén míngzì. I can write my Chinese name. 几 jǐ Adj a few 你要几个苹果? Nǐ yào jǐ gè píngguǒ? How many apples do you want? 前面 qiánmiàn Noun front, frontside 我家前面是咖啡店。 Wǒjiā qiánmiàn shì kāfēi diàn. There’s a coffee shop in front of my house. 十 shí Numeral ten 一瓶水十元。 Yì píng shuǐ shí yuán. A bottle of water is ten yuan. 去 qù Verb to go 昨天我没去学校。 Zuótiān wǒ méi qù xuéxiào. Yesterday, I didn’t go to school. 号 hào Noun number 我的鞋是二十四号。 Wǒ de xié shì èrshísì hào. My shoes are size twenty-four. 后面 hòumiàn Adj behind, backside 学校后面是山。 Xuéxiào hòumiàn shì shān. There’s a mountain behind the school. 吗 ma Question Particle Do you?Is that? 你好吗？ Nǐ hǎo ma？ How are you? 听 tīng Verb to listen, to hear 我喜欢听音乐。 Wǒ xǐhuan tīng yīnyuè. I like to listen to music. 呢 ne Question Particle 我要喝咖啡，你呢？ Wǒ yào hē kāfēi, nǐ ne? I want to drink coffee, how about you? 哪 nǎ Question pronoun which 哪杯咖啡？ Nǎ bēi kāfēi? Which cup of coffee? 哪儿 nǎ’er Adj/Adv where 你想把画挂在哪儿？我想把画挂在这儿。 Nǐ xiǎng bǎ huà guà zài nǎr？Wǒ xiǎng bǎ huà guà zài zhèr. Where do you want to hang the painting? I want to hang the painting here. 四 sì Noun four 中国人不喜欢数字四。 Zhōngguó rén bù xǐhuān shùzì sì. Chinese people do not like the number four. 回 huí Verb to go back, to return 我晚上九点回家。 Wǒ wǎnshàng jiǔ diǎn huí jiā. I go home at nine o’clock. 在 zài Adj/Adv in 我有时候会待在图书馆里看书。 Wǒ yǒu shíhou huì dāi zài túshūguǎn lǐ kànshū. Sometimes I will stay in the library and read books. 多少 duōshǎo Phrase How many 这个多少钱? Zhè gè duōshǎo qián? How much is this? 太 tài Adj too (as in too many) 这件衣服太贵了。 Zhè jiàn yīfú tài guìle. This piece of clothing is too expensive. 她 tā Pronoun she, her 她的手机很好。 Tā de shǒujī hěn hǎo. Her cell phone is very good. 字 zì Noun word, character 写汉字不太难。 Xiě hànzì bù tài nán. It’s not too difficult to write Chinese characters. 小 xiǎo Adj small 我要小杯的绿茶。 Wǒ yào xiǎo bēi de lǜchá. I want a small cup of green tea. 小姐 xiǎojiě Noun Miss, Ms. 张小姐，您好。 Zhāng xiǎojiě, nín hǎo. Hello, Miss Zhang. 工作 gōngzuò Noun/Verb work, to work, job 我的工作是医生。 Wǒ de gōngzuò shì yīshēng. I work as a doctor. 年 nián Noun year 今年是羊年。 Jīnnián shì yáng nián. This is the year of the sheep. 很 hěn Adj very, quite 我今天很累。 Wǒ jīntiān hěn lèi. I’m so tired today. 怎么样 zěnmeyàng Phrase how’s this? how is it? how about that? 今天晚餐吃牛肉，怎么样？ Jīntiān wǎncān chī niúròu, zěnmeyàng? Let’s have beef for dinner tonight, shall we? 我们 wǒmen Pronoun we, us 我们是姐妹。 Wǒmen shì jiěmèi. We are sisters. 时候 shíhòu Phrase when (we were doing sth…), at the time 七月的时候，我去新加坡。 Qī yuè de shíhòu, wǒ qù xīnjiāpō. In July, I’ll go to Singapore. 有 yǒu Verb to have, to own 他有很多法国朋友。 Tā yǒu hěnduō Fǎguó péngyǒu. He has a lot of French friends. 本 běn Measure word measure word for books 这是一本旅游杂志。 Zhè shì yī běn lǚyóu zázhì. This is a travel magazine. 没有 méiyǒu Verb to not have, don’t have 我没有妹妹。 Wǒ méiyǒu mèimei. I don’t have a younger sister. 点 diǎn Noun point, o’clock 现在是五点十分。 Xiànzài shì wǔ diǎn shí fēn. It’s ten past five o’clock now. 电视 diànshì Noun television, TV 我家没电视。 Wǒjiā méi diànshì. My house doesn’t have a TV. 的 de Adj/Adv of, possessive, belonging to 她的名字是玛丽。 Tā de míngzi shì Mǎlì. Her name is Mary. 米饭 mǐfàn Noun rice 我喜欢吃米饭。 Wǒ xǐhuān chī mǐfàn. I like to eat rice. 苹果 píngguǒ Noun apple 我喜欢苹果口味的甜食。 Wǒ xǐhuan píngguǒ kǒuwèi de tiánshí. I like apple flavor sweets. 读 dú Verb to read 读中文书不太难。 Dú zhōngwén shū bù tài nán. It’s not too hard to read Chinese books. 这 zhè Adj this 这是我妈妈。 Zhè shì wǒ māmā. This is my mother. 都 dōu Adj/Adv all, every 他们都是我的朋友。 Tāmen dōu shì wǒ de péngyǒu. They are all my friends. 里 lǐ Adj in, inside 我的包里有一瓶水。 Wǒ de bāo li yǒuyī píng shuǐ. There’s a bottle of water in my bag. 饭店 fàndiàn Noun restaurant 这是一间新开的饭店。 Zhè shì yī jiàn xīn kāi de fàndiàn. This is a newly opened hotel. 1000 Most Common Chinese Words Thank You in Chinese 5 Fun Ways for Kids to Learn Chinese Learn Chinese Tones in 3 Minutes w/ “The Dentist Story” I can’t speak Chinese at all! Can I survive in China? This entry was posted in Chinese Language Learning, Chinese Survival Skills, Language Learning and tagged chinese words, learn chinese, list of chinese words. Bookmark the permalink. I can’t speak Chinese at all! Can I survive in China?